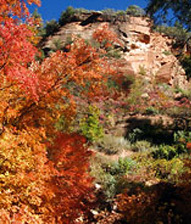 This fall visit Sedona and take in all the beauty that is this magical place. El Portal Sedona Hotel is the perfect place to stay while in Sedona and see the Grand Canyon or Oak Creek Canyon. El Portal Sedona is a AAA Four Diamond hotel, was voted as a “Top Small Hotel in the U.S.” by Condé Nast Traveler, and is recommended by National Geographic magazine. It is a unique lodging experience, no plastic card and long hallways here. We meet with our guests each morning to help plan their day so they will get the most out of their Sedona experience. The boutique hotel has hiking and biking guides on staff, offers free drop off and pick up to trail heads for hiking, jeep tours of Sedona and photo adventures are available every day. We are centrally located, just steps from Tlaquepaque Arts and Crafts Village with eclectic shopping, dining and art galleries. Book a three day trip this fall and receive a $100.00 jeep adventure credit. Call and ask for details, or book online and say “3 Day Special” in the comment line. Must be booked after September 20th; valid until November 20, 2012. (Some restrictions apply). Time to book for November and December as we are filling up fast!